This volume, like each in the Brazos Theological Commentary on the Bible, is designed to serve the church--through aid in preaching, teaching, study groups, and so forth--and demonstrate the continuing intellectual and practical viability of theological interpretation of the Bible. 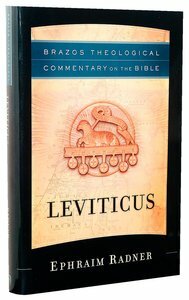 Leviticus is the fifth volume in the series. - Publisher This volume, like each in the Brazos Theological Commentary on the Bible, is designed to serve the churchathrough aid in preaching, teaching, study groups, and so forthaand demonstrate the continuing intellectual and practical viability of theological interpretation of the Bible. About "Leviticus (Brazos Theological Commentary On The Bible Series)"
This volume, like each in the Brazos Theological Commentary on the Bible, is designed to serve the churchathrough aid in preaching, teaching, study groups, and so forthaand demonstrate the continuing intellectual and practical viability of theological interpretation of the Bible. Ephraim Radner (PhD., Yale University) is professor of historical theology at Wycliffe College, University of Toronto, an Episcopal priest he was formerly rector of Church of the Ascension, Pueblo, Colorado. and is the author of The End of the Church: a pneumatology of Christian division in the West (Eerdmans), The Fate of Communion:The Agony of Anglicanism and the Future of a Global Church(Eerdmans), Hope among the Fragments: The Broken Church and Its Engagement of Scripture (Brazos), and Leviticus (Brazos Theological Commentary on the Bible). In recent decades, a critical mass of theologians and biblical scholars has begun to reassert the priority of a theological reading of Scripture. This insightful theological exegesis of 1 & 2 Peter will be of use to professors and students in New Testament, the Epistles of Peter, and theological interpretation courses, as well as pastors, church leaders, and libraries. This addition to the well-received Brazos Theological Commentary on the Bible offers a theological exegesis of 1 Samuel. In this edition to the well-received Brazos Theological Commentary on the Bible, Aran Murphy unfurls the story of God's drama with Israel through 1 Samuel. This commentary, like each in the series, is designed to serve the church--providing a rich resource for preachers, teachers, students, and study groups--and demonstrate the continuing intellectual and practical viability of theological interpretation of the Bible. The Brazos Theological Commentary on the Bible enlists leading theologians to read and interpret scripture creedally for the twenty-first century, just as the church fathers, the Reformers, and other orthodox Christians did for their times and places. 1 Samuel, like each commentary in the series, is designed to serve the church--providing a rich resource for preachers, teachers, students, and study groups--and demonstrate the continuing intellectual and practical viability of theological interpretation of the Bible. This addition to the well-received Brazos Theological Commentary on the Bible offers a theological exegesis of 1 Samuel. This commentary, like each in the series, is designed to serve the church--providing a rich resource for preachers, teachers, students, and study groups--and demonstrate the continuing intellectual and practical viability of theological interpretation of the Bible.